Have you heard there’s a giant planet in the Solar System headed straight towards Earth? At some point in the next few months or years, this thing is going to crash into Earth or flip our poles, or push us out of our orbit, or some other horrible civilization destroying disaster. I’m glad to give a straight answer: No. Any large object moving towards the inner Solar System would be one of the brightest objects in the night sky. It would mess up the orbits of the other planets and asteroids that astronomers carefully observe every night. There are millions of amateur astronomers taking high quality images of the night sky. If something was out there, they’d see it. These rumours have been popping up on the internet for more than a decade now, and I’m sure we’ll still be debunking them decades from now. What people are calling Planet X, or Nibiru, or Wormwood, or whatever doesn’t exist. But is it possible that there are large, undiscovered objects out in the furthest reaches of Solar System? Astronomers have been searching for Planet X for more than a hundred years. In the 1840s, the French mathematician Urbain Le Verrier calculated that another large planet must be perturbing the orbit of Uranus. He predicted the location where this planet would be, and then German astronomer Johann Gottfried Galle used those coordinates to discover Neptune right where Le Verrier predicted. The famed astronomer Percival Lowell died searching for the next planet in the Solar System, but he made a few calculations about where it might be found. Astronomers continued searching for additional large objects, but it wasn’t until 2005 that another object the size of Pluto was finally discovered by Mike Brown and his team from Caltech: Eris. Brown and his team also turned up several other large icy objects in the Kuiper Belt; many of which have been designated dwarf planets. We haven’t discovered any other large objects yet, but there might be clues that they’re out there. In 2012, the Brazilian astronomer Rodney Gomes calculated the orbits of objects in the Kuiper Belt and found irregularities in the orbits of 6 objects. This suggests that a larger object is further out, tugging at their orbits. It could be a Mars-sized object 8.5 billion km away, or a Neptune-sized object 225 billion km away. There’s another region at the edge of the Solar System called the Oort Cloud. 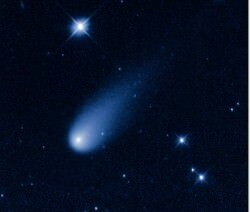 This is the source of the long-period comets that occasionally visit the inner Solar System. It’s possible that large planets are perturbing the orbits of comets with their gravity, nudging these comets in our direction. Curiosity hams it up at “Rocknest” in Gale Crater on Mars. The car-sized rover used the Mars Hand Lens Imager (MAHLI) on October 31st and November 1st to capture dozens of high-resolution snapshots. This self-portrait shows the surrounding terrain including Gale Crater’s northern wall and Mount Sharp in the background. Read more about Curiosity’s Incredible Self-Portrait. A magnificent filament from a medium sized flare produced one of the best shows of 2012 for the Solar Dynamics Observatory. Some of the particles from this eruption smashed into Earth producing beautiful aurora. SDO also witnessed a celestial event that’s only happened seven times since the invention of the telescope; the transit of Venus across the Sun. Daredevil Felix Baumgartner poised at the edge of space about to break the sound barrier during a skydive is one of my favorite images of 2012. Read all about the record-setting freefall. This mosaic from NASA’s Dawn spacecraft stitches together the best views of the asteroid Vesta. Highlights of the image include the towering south pole mountain – twice as high as Earth’s Mount Everest – and a set of three craters known as the “snowman” in the upper left of the image. Read more about Dawn’s parting shots of Vesta. Released in 2012 but taken in 2011, ESA’s Envisat shows the amazing artwork that is Earth. This phytoplankton bloom swirls in the ocean currents creating a figure-8 pattern in the South Atlantic Ocean near the Falkland Islands. Read more. A ‘Blue Marble’ image taken from NASA’s Suomi NPP Earth-observing satellite offers a snapshot of Earth’s surface on January 4, 2012. NASA released a night-time version called the ‘Black Marble’ in December 2012. The image at right features the threadlike connections of city lights across the eastern hemisphere. See more of the Black Marble images. Astronauts aboard the International Space Station used their lofty perch to take some awesome images of Earth in 2012. Expedition 33 crew look at exhaust trails from the Soyuz rocket that blasted off from the Baikonour Cosmodrome in October heading toward a rendezvous with the ISS. Exhaust plumes curled in different directions due to winds blowing in different directions as the rocket ascended through various atmospheric layers. Astronauts shot an image of delicate shining threads called polar mesospheric clouds as they zoomed across the Tibetan plateau in June 2012. Also known as noctilucent or night-shining clouds, this image is the first time astronauts caught the phenomenon from orbit. Sea ice forms along the Pacific coastline of the Kamchatka Peninsula in this image from Expedition 30 in March 2012. Large circular eddys spin off from the southwestward flowing Kamchatka current. While the sea ice looks thin and delicate, the smallest features in this image are several meters across. North is to the left in the image. The ISS was sailing over Nova Scotia when astronauts caught sunglint reflecting off the Great Lakes of North America. Featured in the image are New York’s Finger Lakes, Lake Ontario, Lake Huron and Lake Erie. Most of Canada is hidden under a blanket of clouds toward the curving horizon in this image. The European Southern Observatory’s Visible and Infrared Survey Telescope for Astronomy, or VISTA, captured what may be one of the most stunning images of the planetary nebula called the Helix Nebula, or NGC 7293. Thor’s Helmet Nebula, in Canis Major, was taken to celebrate the ESO’s 50th anniversary in October 2012. A bright massive star blew this colossal cosmic bubble in the surrounding nebula. ESO’s Very Large Telescope captured a vast panorama full of exotic cosmic landscapes, glowing gas and new stars in this image of the Carina Nebula. NASA’s Hubble Space Telescope shot this most detailed view of the dusty core of Messier 82, or the Cigar Galaxy. Resembling an angel, the bi-polar star-forming region called Sharpless 2-106, or S106, blazes brightly in this image from NASA’s Hubble. Super hot gas, glowing blue in the image, contrasts with the cooler red-colored gas and dust. Deep in this image – a tiny slice of sky taken with the Hubble – lie some of the most distant galaxies observed to date. The image shows the Hubble Ultra Deep Field 2012 and improves upon the previous Ultra Deep Field image. NASA’s Spitzer Space Telescope has amassed a vast collection of infrared images. Spitzer can find beauty hidden in behind the densest dust clouds. This nebula is found in the constellation Scutum. I think it looks like a bumblebee. The giant star Zeta Ophiuchi zips along so quickly that it creates a bow shock in the surrounding nebula. These gossamer ripples glow in infrared and can only be seen with Spitzer’s instruments. NASA’s Cassini spacecraft continues to dazzle with this detailed close-up of the vortex at Saturn’s north pole in this image taken in November 2012. Nearly as dazzling as the images, the skill of Cassini imaging team at finding unique shots is impressive. The bright moon Enceladus sits before the rings with the larger moon Titan glowing dimly in the distance. Cassini took this image in April 2012 from a distance of about 600,000 miles (1 million kilometers) from Enceladus. Taken by Cassini at the beginning of 2012, Saturn’s moon Tethys lies before the wide shadows cast onto Saturn. Sunlight scatters through the edge of Titan’s atmosphere in this image from Cassini. At the bottom of the moon’s limb, a hint of the high clouds that form the south polar vortex on Titan can be seen. A tour of Saturn wouldn’t be complete without a beauty shot of the planet’s sweeping rings and complex cloud systems. Dwarfed by Saturn, Mimas sits near Saturn in this image from Cassini. 2012 is also known for some goodbyes. The three remaining shuttles were retired and sent to museums around the country. Space Shuttle Discovery, mounted atop a NASA 747 Shuttle Carrier flies near the US Capitol on April 17, 2012 enroute to its final home at the National Air & Space Museum’s Steven F. Udvar-Hazy Center. The Moon and Jupiter above the dishes in Canberra, Australia. Credit: Carlos Orue. The full Moon today is considered a bonus for 2012, since it is the 13th full Moon of the year. But this full Moon has also been a bonus in the sense that we’re getting several nights in a row of nearly full Moons. According to Universe Today’s Phases of the Moon App, the face of the Moon on the night of the 25th was 96% illuminated; on the 26th it was 99% illuminated; the night of the 27th/morning of the 28th was the full Moon, (officially, the Moon was most full at 10:21 UTC (4:21 EST this morning), and tonight, the 28th, the face of the Moon is again 99% illuminated. And if you’re enjoying a wintery landscape like I currently am, the brilliance of the Moonlight on snow is bright enough to keep you awake at night. Enjoy some great astrophotos submitted for photographers around the world of the bonus — and final — full Moon of 2012. The last full Moon of 2012 — the Full Cold Moon, as seen from the James C. Veen Observatory near Lowell, Michigan. Credit: Kevin on Flickr. Full Moon, December 27, 2012 from London, England. Credit: Sculptor Lil. Templo de la Serpiente Emplumada / Temple of Quetzalcoatl. Credit: César Cantú. Click on the image for access to a larger version. Our friend César Cantú sent us this image today, and it seemed perfect to share on the day where nothing apocalyptic happened. Hopefully, the day turned out for all our readers as only a chance to have a party and share a few jokes, to realize the specialness of those around you, or just to finish up your holiday preparations. As someone once said, “Live long and prosper,” and as 2012 comes soon to a close, that is our wish to all of you. Both NASA and ESA have released videos looking back at the year 2012 in space. With Curiosity on Mars, the Flight of the Dragon, Venus Transit, ATV’s trips to the ISS, the flight of Vega, and much more, it was quite a year. NASA is trying to make sure that no one is taking the 2012 doomsday nonsense seriously, and just put out this video today detailing how a gigantic “killer solar flare” just ain’t gonna happen. Dr. Alex Young from the Goddard Space Flight Center explains how the Sun’s regular 11-year solar cycle is expected to peak in 2013 and 2014, not on December 21 of this year. Plus, this current solar cycle has been kind of a dud as far as wild activity goes, and scientists are not expecting the peak of this cycle to even be as strong as the previous one, which was rather mild. Solar prominence in H alpha, with Earth scale model. Credit: John Brady. Not to mention, Earth’s atmosphere keeps us well protected here on Earth. 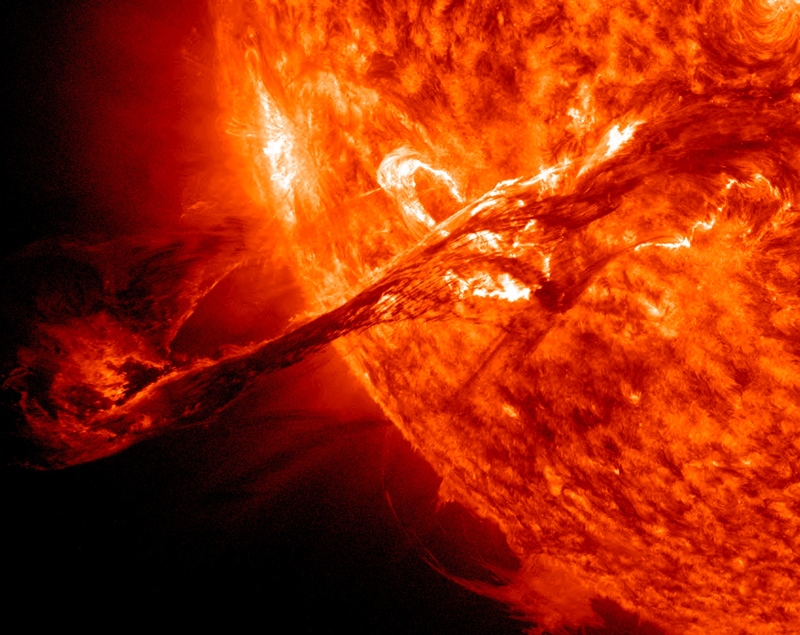 The only thing we do have to be concerned with is how solar flares and coronal mass ejections (CMEs) can damage satellites and even impact the power grid on Earth; additionally astronauts in Space to have to be specially protected as they are outside of the protection of the atmosphere. Although we don’t subscribe to hokum like numerology or think that dates on a man-made calendar could have any sort of cosmic significance, there is something about a little symmetry. The GOES-15 satellite captured this image of Earth today, which is 12/12/12 on the Gregorian calendar, and even added a bonus of taking the image at 1200 UTC. Too bad the GOES-12 spacecraft had some thruster problems and is currently in a standby mode. Dennis Chesters, project scientist of NASA’s GOES Project at the NASA Goddard Space Flight Center said this image does something significant, however: the fourth tropical cyclone in the southern Pacific Ocean. Newborn Tropical Storm Evan was born today, Dec. 12, 2012 at 1500 UTC (10 a.m. EST) and appears as a rounded area of clouds in the bottom left corner of the image. Tropical Storm Evan is about 145 nautical miles west of Pago Pago, American Samoa. On November 14, 2012, tens of thousands of viewers across northeastern Australia got a great view of one of the most awe-inspiring sights in astronomy — a total solar eclipse. Of course many fantastic photos and videos were taken of the event, but one team of high-tech eclipse hunters from Romania went a step further — or should I say higher — and captured the event from a video camera mounted on a weather balloon soaring over 36,800 meters (120,000 feet) up! During a solar eclipse the Moon passes in front of the disk of the Sun, casting its shadow upon the Earth. Any viewers within the darkest part of the shadow — the umbra — will experience a total eclipse, while those within the wider, more diffuse shadow area along the perimeter — the penumbra — will see a partial eclipse. By launching a weather balloon carrying a wide-angle camera into the stratosphere above Queensland, eclipse hunter and amateur astronomer Catalin Beldea, ROSA research scientist Florin Mingireanu and others on the team were able to obtain their incredible video of the November 14 total eclipse from high enough up that the shadow of the Moon was visible striking Earth’s atmosphere. Totality only lasted a couple of minutes so good timing was essential… but they got the shot. Very impressive! The mission was organized by teams from the Romanian Space Agency (ROSA) and Stiinta&Tehnica.com, with the video assembled by Daniel Toma and posted on YouTube by editor-in-chief Marc Ulieriu. Music by Shamil Elvenheim.